How many episodes of The A-Team have you seen? Hannibal: I love it when a plan comes together! Q: Why Was Dirk Benedict Not In the Pilot Episode? Q: Were any of the characters based on real life? Q: For what crime, that they did not commit, were they sent to prison for? 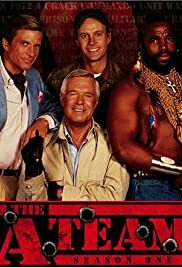 "The A-Team" is a guilty pleasure for the two generations of viewers who have embraced the series. It never attempted to be "Masterpiece Theater", but 'cotton candy for the brain', with the best episodes replaying the same scenario over and over (Underdog gets mauled by Big Bad Villain and his Baddies...calls in Our Heroes, who end up defending the Underdog on a 'deferred payment' plan...Our Heroes Stomp the Baddies, then get themselves captured...in true "MacGiver"-like fashion, they use the materials at hand, creating homemade lethal, yet non-fatal weapons in insanely short order...the Baddies are Crushed, and Our Heroes split, seconds before the Authorities arrive to arrest them). What made the series so popular was never the 'ritual' of the plots, however; if you loved the show, it was because of the chemistry of the stars. Hannibal, B.A., Face, and Murdock were all likable guys, and seemed to enjoy every moment together...and fans of the series have always 'picked up' on that camaraderie. 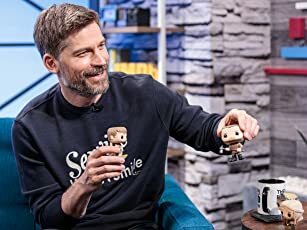 The brainchild of Stephen Cannell and Frank Lupo, NBC loved the concept of the show, and gave the series a prime 'starting' point, airing the pilot episode after a Super Bowl, guaranteeing great initial ratings. Featuring Tim Dunigan as 'Face' (Dirk Benedict was unavailable for the pilot), the show benefited enormously from Mr. T's presence, as ROCKY 3 had made him an overnight star. Another 'plus' was George Peppard's return to weekly television; his "Banecek" had been a much loved NBC series, until he walked off the show (Cannell, one of the writers of the earlier series, understood the ex-alcoholic Peppard's occasional mood swings, and offered him a large salary and a lot of creative control in the new series, resulting in one of the happier periods in the actor's tragic life). A major discovery for "The A-Team" was Dwight Schultz, as 'Howling Mad Murdock'. A remarkably versatile actor, Schultz was adept at accents, physical humor, and rapid-fire one-liners, and his exchanges with Mr. T were funny without ever being demeaning. Peppard took a liking to the young actor, as well, and the warmth between the pair could be seen in nearly every episode. With Benedict's arrival (he had been the break-out star of "Battlestar Galactica", and had a large female following), Peppard had all the elements he felt were needed to make "The A-Team" work...which didn't bode well for the one female regular, Melinda Culea, as reporter Amy Allen. Although she gave the show a more balanced slant, and was excellent in her role, Peppard always considered her a 'fifth wheel'...and when Cannell did not renew her contract for the third season, it was generally assumed that George Peppard used his leverage to oust her. A new female character was introduced, played by Marla Heasley, but her character would remain less active, and would have a story 'arc' that would have her leave the series in 1985. A television show with a single concept, no matter how enjoyable the cast, can't run indefinitely, and by the end of the fourth season, "The A-Team" had pretty well exhausted all the variations the writers could imagine. Entertainment figures (Hulk Hogan, Boy George and the Culture Club, Rick James, Isaac Hayes) appeared in weak efforts to bolster ratings, and NBC pressured Cannell to make major changes to the series. Bowing to network pressure, the fifth season began by having the A-Team finally captured and court-martialed. Escaping with the aid of new regular Frankie Santana (Eddie Velez), the team soon found themselves 'prisoners' of a secret government agency run by Gen. Hunt Stockwell (Robert Vaughn), who offered them full pardons if they would take on a number of assignments "too risky" for the U.S. intelligence community to handle. The episodes sank to formulaic "Mission Impossible" clones, with George Peppard's authority lost to new boss Vaughn, and the 'blue-collar' charm of the earlier seasons sadly absent. When the series was canceled, while fans mourned, few were surprised. What has been a surprise is the 'cult' status the series has achieved in the years since it left the air. While George Peppard never lived long enough to see it happen (he died in 1994, from pneumonia), the still-growing popularity of the show has been a source of pride and amazement for Benedict, Schultz, and Mr. T (who nearly died of cancer, but has made a complete recovery), and the show is about to re-emerge as a feature film, with Stephen Cannell producing. Not bad for a 'single concept' series!